Volvo Car UK has revealed the price tag for the all-new Volvo V40: the premium 5-door hatchback. On the road at a competitive £19,745, the Volvo V40 with its impressive range of top-class features and brilliant technology is a sound investment when it comes to a lease or purchase of this vehicle. Considered the safest vehicles in the world, Volvo has taken this concept one step further with the introduction of airbags for pedestrians: a world first. Working through a series of front bumper sensors, airbags are deployed upon impact in a split second: a unique and reassuring safety feature, aimed primarily at the head. We can also enjoy bluetooth facilities in virtually all of the models, a panoramic glass roof and park assist pilot. This is an intelligent compact car BIG on elegance with class leading driving dynamics. The V40 certainly does make an instant and lasting impression. 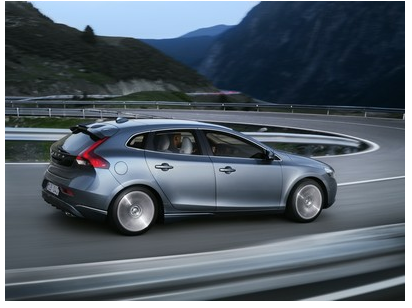 With its sleek and low silhouette, the V40 is far from ordinary and is a staggering mix of versatility, design and safety. Car buyers will be able to order the luxury Volvo V40 as early as May this year with delivery anticipated for around September time. If you’re interested in buying or leasing a new vehicle contact our sales team. Alternatively,visit our website where you will find new and used Volvo’s available for sale or on finance as well as it’s competition like the Mercedes A-Class.